You can save a list of titles you've downloaded to OverDrive's app for iOS (iPhone/iPad/iPod touch), Android, Fire tablets, or Chromebook. You can keep the list for your records, but you won't be able to restore it if it's ever lost or deleted. Tap Select all or choose individual titles, then tap the Share icon. You can then email your title history to yourself (or others). 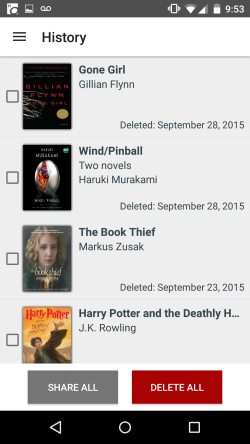 Click or tap History, then select Share all, or choose individual titles, then select Share. You can then email your title history to yourself (or others), or choose another export option, if available. If your device doesn't show any titles under "History," you can enable the feature in "Settings" for future use. 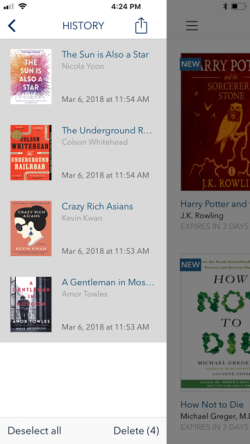 Use the Show in History and remember bookmarks for... drop-down menu to select how many titles you'd like the app to remember.